The shared workspace may include two or more projected displays, each generated by a separate electronic device. Images may be transferred between the projected displays within the shared workspace. For example, the electronic devices may communicate with each other over a communication link that allows data for images to be transferred between the electronic devices for display on different projected displays within the shared workspace. 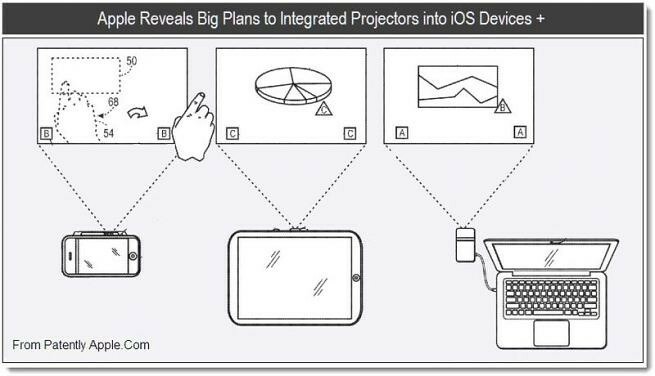 This isn’t the first time Apple has flirted with projector concepts in patents. In April we told you about a patent detailing an Apple-branded TV with “hybrid laser” projection technology. We also reported a published Apple patent describing an internal pico projection system for MacBooks in April, 2010.